Update, Tuesday 8am: The fire which ravaged the Notre-Dame Cathedral’s roof since Monday evening has been brought under control. Firefighters have saved the stone walls, structure of the building, and internal artwork, but were unable to save much of the roof and iconic 90 metre-tall spire. The cause of the fire remains unclear, but officials suspect that it was caused by maintenance work on the structure. One firefighter has been seriously injured. French president Emmanuel Macron has pledged that the country will rebuild the cathedral, with donations from the likes of Francois-Henri Pinault — the billionaire owner of Gucci and YSL — pledging €100-million towards the effort. Original article: Paris’ historic Notre-Dame Cathedral is on fire. The blaze, which broke out around 7pm SAST on Monday evening, has engulfed much of the building’s roof. A slew of Periscope live streams on Twitter are currently broadcasting the development of the fire. #NotreDame is also trending worldwide at the time of writing. Paris’ mayor Anne Hidalgo has asked everyone to “respect the security perimeter”. Part of the building’s main spire has collapsed due to fire damage. Parisians have also joined in hymns outside of Notre-Dame Cathedral, as firefighters continue to battle the blaze. Initially completed in 1345, the cathedral spires 90 metres into the Paris skyline. 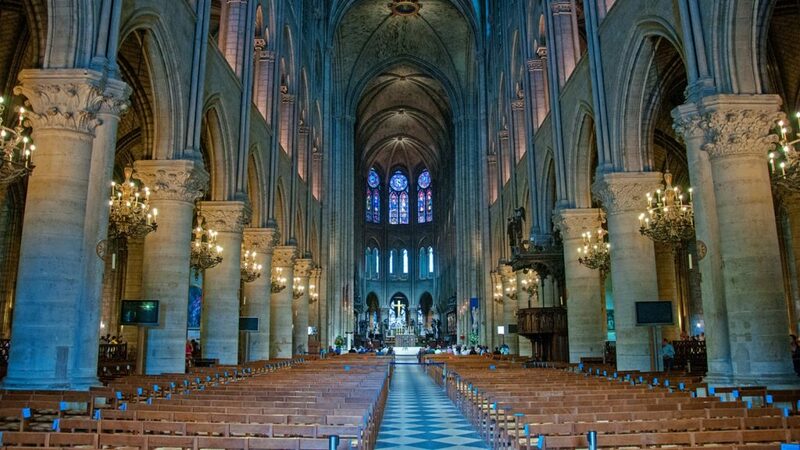 The building is also the setting for the 1833 Victor Hugo novel, Notre-Dame de Paris, or The Hunchback of Notre-Dame.